Bakers make traditional diplomat pudding with soaked ladyfingers or cake baked with fruit and custard. In this take, Frédéric Morin likes using the leftover croissants from Niemand Bakery. He says he always buys too much of everything ("Ask my wife," he says, "I even buy too many T-shirts"), so he created this simple recipe for using up his leftovers. Preheat the oven to 425°. Put the raisins in a bowl and cover with the whiskey. Spread the croissant pieces on a baking sheet and toast for about 10 minutes, stirring once, until golden brown. Let cool. Lower the oven temperature to 350°. Butter a 9-by-13-inch baking dish. In a large bowl, whisk the pumpkin pie filling with the cream, milk, eggs, sugar and salt. In the prepared baking dish, toss the croissants with the raisins and whiskey. Pour the pumpkin mixture on top, pressing with the back of a spoon until most of the croissants are moistened. Bake for about 40 minutes, until the center is just set; tent with foil if the top starts to brown too quickly. 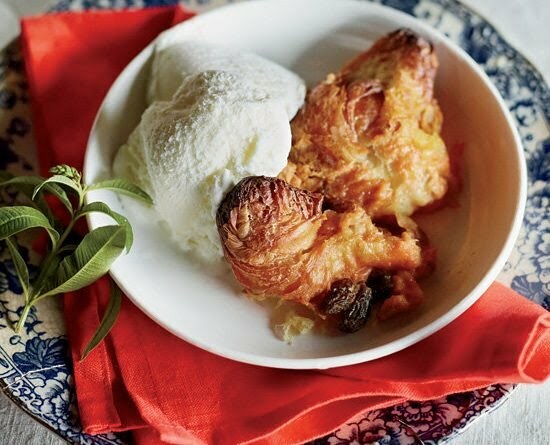 Let cool to warm and serve with vanilla ice cream.